EghtesadOnline: Iranian steel mills produced a total of about 25 million tons of crude steel in 2018, up 17.7% compared with 2017, according to the latest report released by World Steel Association. Iran’s December steel output grew 14.1% year-on-year to hit 2.26 million tons, the Brussels-based international trade body for the iron and steel industry added. Iran has been ranked the world’s 10th biggest steel producer in 2018. The country is placed between Brazil (ninth) with 34.73 million tons and Italy (11th) with 24.47 million tons. The world’s 64 steelmakers produced a total of 1.78 billion tons of steel in 2018, up 4.5% YOY, Financial Tribune reported. The country was followed by India with 106.46 million tons, Japan with 104.32 million tons, the United States with 86.69 million tons, South Korea with 72.46 million tons, Russia with 71.68 million tons, Germany with 42.44 million tons and Turkey with 37.31 million tons. Iran’s crude steel output stood at 21.23 million tons in 2017, according to Worldsteel, up 21.4% YOY. The report shows global direct-reduced iron output increased 6.2% year-on-year to 7.12 million tons in December. 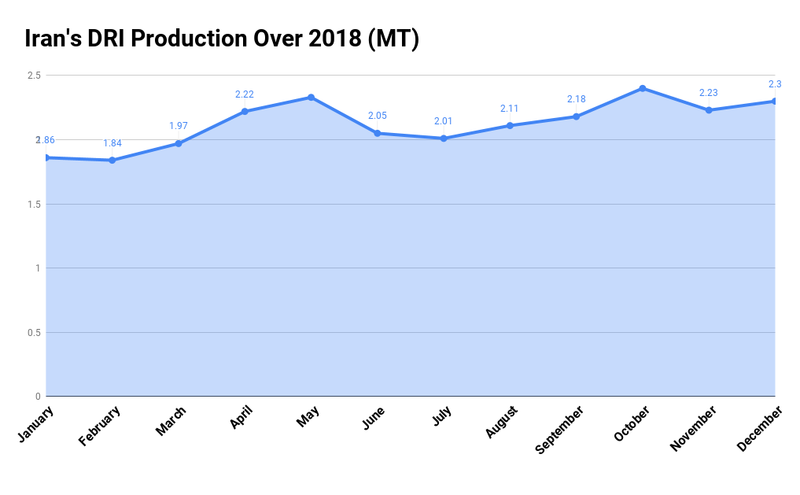 Production for 2018 grew 11.6% year-on-year to 84.12 million tons. Iran was the second biggest producer with 2.3 million tons of DRI production in December and 25.54 million tons in 2018. The largest increase was in Argentina, where output increased 30.5% YOY to 1.6 million tons. Iran aims to become the world’s sixth largest steel producer as per the 20-Year Vision Plan, which targets an annual production capacity expansion to 55 million tons and 20-25 million tons of exports per year by 2025. Iranian steel mills have so far realized just over 30 million tons of the capacity target. The country has been working to increase its iron ore processing capacity, including both DRI and hot-briquetted iron production to feed its steelmaking expansion target. Although the move is largely directed at the country’s oil industry and banking system, it is still expected to aggravate the situation in the Iranian export steel market, which had already been hit by the previous set of sanctions imposed by US President Donald Trump’s administration in early August. Shipping problems are said to be the prime issue at present. 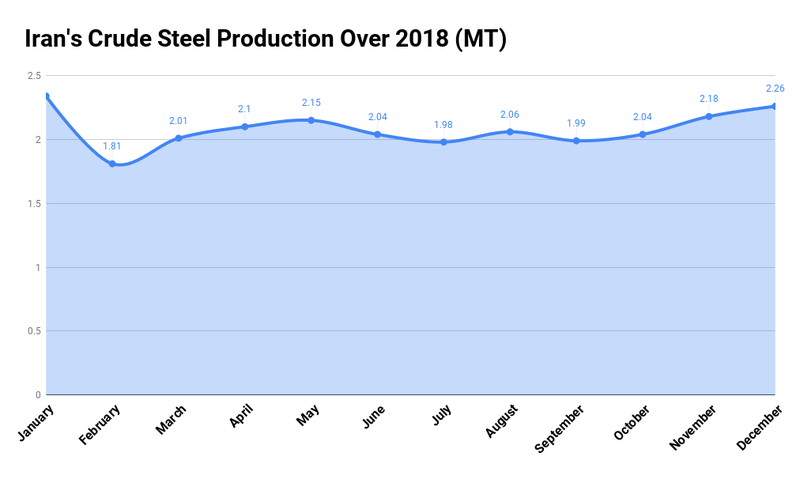 The Iranian Steel Producers Association's latest report shows 5.82 million tons of finished and semi-finished steel products were exported from Iran during the first nine months of the current fiscal year (March 21-Dec. 21) to register a 2.36% year-on-year growth. Semi-finished steel made up 3.67 million tons or more than 63.11% of the total export volume, down 20% YOY. Billet and bloom had the lion’s share of semis exports with an aggregate of 2.29 million tons to mark an 11% decline YOY. Slab followed with 1.37 million tons, down 32% YOY. Exports of direct-reduced iron decreased 16% YOY to 432,000 tons during the nine-month period. The ninth edition of the annual two-day "Iranian Steel Market Conference" (ISMC 2019) is scheduled to be held in Tehran from Jan. 29 to 30. The venue of the two-day event, hosted and organized by Donya-e-Eqtesad Media Group, the parent company of Financial Tribune, will be the Islamic Republic of Iran Broadcasting’s International Conference Center. * Water, energy and environment. Worldsteel: Iran Steel Output Rises 21% in Jan.-Aug.